This is a Personally taken Colour 10" x 8" Photo of the former Barcelona and Holland Footballer which was Signed In Person by him at a later date. Phillip John-William Cocu ( born 29 October 1970) is a Dutch professional football manager and former player, currently coaching PSV Eindhoven. Cocu was born in Eindhoven but raised in Zevenaar, playing youth football for local clubs DCS and De Graafschap. After a year at AFC '34, he started his professional career at AZ. In 1990, Cocu moved to Vitesse. A broken fibula disrupted his first season, but he became a first-team regular in the following four seasons. In 1995, he joined PSV Eindhoven, where he won the KNVB Cup and the Eredivisie title in 1997. 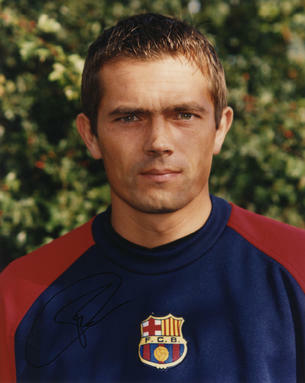 Cocu played for FC Barcelona between 1998 and 2004. There, he would become club captain, win La Liga in 1999 and play two Champions League semi-finals. At his return to PSV in 2004, he was the foreign player with the most league appearances for Barcelona. During Cocu’s second stint at PSV, he won another three Eredivisie titles and reached the Champions League semi-finals. After a year at Al Jazira, Cocu retired. Cocu debuted for the Netherlands national team in 1996 and appeared at the 1998 World Cup, scoring two goals but missing a penalty in the semi-finals against Brazil. He also played at the 2006 World Cup, as well as the 1996, 2000 and 2004 European Championships. Cocu reached the semi-finals in the latter two tournaments and in 2004, he served as captain of the Dutch team. With 101 caps, Cocu is fifth on the list of most Dutch international appearances. During his career, he mainly played as a defensive ‘playmaker’ midfielder, but became equally known for his ability to be fielded as a defender, wing back, winger or forward. After his retirement, Cocu joined PSV again as youth coach and later assistant manager. He also served as assistant at the Dutch team under Bert van Marwijk between 2008 and 2012. Cocu was caretaker manager at PSV in 2012, during which he won the KNVB Cup. In 2013, he was officially appointed as PSV manager.